Snowy Baker : Surfing with Duke, 1918 . "Snowy" Baker: General Physical Culture, Melbourne. G.Robertson & Co., 1910. Pages 54 to 61.
stand before the largest breaker. surf-board to support the rider of the waves. sports of all kinds, and a physical culture expert. 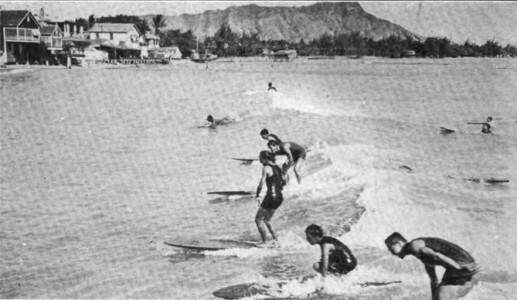 A thrilling Surf-board Stunt at Waikiki. During the trip across from Australia, I was looking forward to a meeting with the world-famous swimmer, Duke Kahanamoku. On arriving at Waikiki, it was not very long before this aquatic star was introduced to me. What a ﬁne fellow he is! He stands quite six feet high, and is built proportionately. On looking him over, I could easily picture him a world-beater. Together with the Duke, I motored round to the various clubs surrounding this famous watering place, and met a whole host of ﬁne people, who all greeted me with the greatest of courtesy. At Waikiki beach one, on ﬁrst glimpse,is bound to be a bit disappointed after seeing the stretches of golden sand we have around sunny New South Wales. Beginners in the Small Surf, Near Shore. it is not the bed of the sea they come for, but to shoot the breakers. 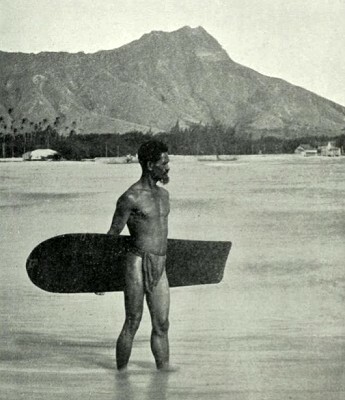 I was invited by the Duke to accompany him into the water, and try surf-shooting with the big boards; a sport that has been made famous the world over by the natives of these islands of Hawaii. From the veranda of the hotel, I had watched for some considerable time the wonderful feats performed by the native surfboard riders. To see these natives go through their various performances on the big waves is almost astounding. Kahanamoku arranged a special display by the creme de la creme of Hawaii‘s surf shooters. He knew I was an enthusiast in swimming and surf bathing, as well as boxing. 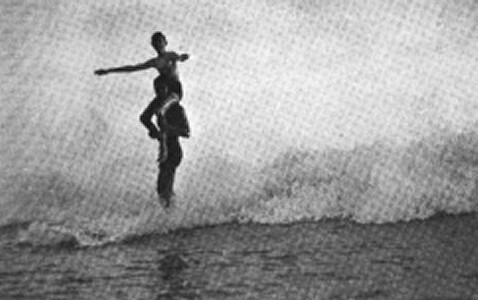 The surf-board riders had with them what they called “old men boards." They are up to ten feet long by three feet wide. They are fairly light and are paddled out over the water by the surfer, and in this manner they skim along at an alarming rate, until at length you can hardly espy them in the distance. It struck me as being rather peculiar (after in Sydney having always taken the wave as it goes to break) to seethe manner in which these fellows take big green waves that apparently have no intention of breaking at all. Lying here like a ﬂotilla of torpedo boats, they will suddenly espy somewhere out to sea a wave that will suit all purposes. and they let out a most unearthly yell and move outwards or inwards, so that they may have their boards in position to take it. They point their boards in-wards and paddle for their lives with the big green comber chasing them in the rear. When it overtakes them they stop paddling and steer with their feet. When once they get their board correctly on the wave they “carry on" with some of the most amazing antics. I saw one man standing on his head while the board was traveling along at the rate of thirty knots per hour. and in another instance, I saw one board-rider standing perfectly upright, with another fellow standing on his shoulders. I thought it quite an extraordinary piece of work, but I am told it is a common occurrence here. They throw somersaults and do all manner of things whilst they are rushing shorewards. which absolutely thrilled me, I was naturally anxious to get in and have a try at it. I suggested this to the "Duke," who readily consented to seeing me through, so we entered the water together. We proceeded to paddle our boards out over the shallow waters of the bay for some distance. Of course, the "Duke" was quite an adept at it, but my board would persist in going the wrong way. We eventually reached the appointed spot out to sea, and he endeavored to explain and show me the method of board riding. We did not venture out nearly so far as the natives whom I spoke of before, but got closer in where the waves were breaking. A suitable wave came and he mounted me on the board and shoved me off shorewards, but, oh! what a dumper I got. I travelled down, down, down towards that horrible coral bed I spoke of before. I simply thought I was never coming to the surface. All sorts of things whizzed through my brain; I thought of all the strange antics I had just a moment ago seen the black fellows doing, and at the same time, the miserable imitation I had made. As I struggled through the water to reach the top, I had scarcely any breath left, and on emerging, the “Duke” was laughing ﬁt to split. I felt like being annoyed, but, of course, could not with such a good-hearted fellow as I had with me. I tried another breaker with the board and got on a little better on this occasion. just missing a nasty dump. After a few times with "Duke" aiding me with practical advice the whole- time, I succeeded to a certain degree, and it was not long before my board whizzed along tossing spray on all sides. To come down on the crest of a huge wave at Manly is a wonderful sensation, but to come down on a big board and tear along at a terriﬁc rate is the very pinnacle of thrill and exhilaration. Of course, surf-board riding is not possible on Sydney beaches, because the waves are not suitable. The waves at Waikiki are long and low, and on occasions do not even break at all, whilst on the Sydney beaches they are high, and from what I know of them they are often very inclined to "dump." To shoot our breakers in Australia with these big boards would entail too much danger both to the rider and those bathing around. I do not suppose I exaggerate at all when I say that the breakers on this beach are longer than on any other beach in the world. I am told that it is on record here that the native surf-board riders have ridden for a mile. I know this sounds "tall," but my authority was good. There are great long, regular, sweeping billows after a storm at Waikiki that carry the natives in for quita mile, and there are rollers after a big “Kona” storm that sweep across Hilo Bay, on the big island of Hawaii, that carry the native surf-board riders in miles at a run. Just on the right hand side of Waikiki is a huge headland. known as Diamond.Head. which resembles. somewhat, a couchant lion. It casts giant shadows across the bay, and it is in these shadows that the native surf-board riders will be seen frolicking on the waters. I shall never forget the “slides” I had down the face of those “green mountains" at Waikiki. 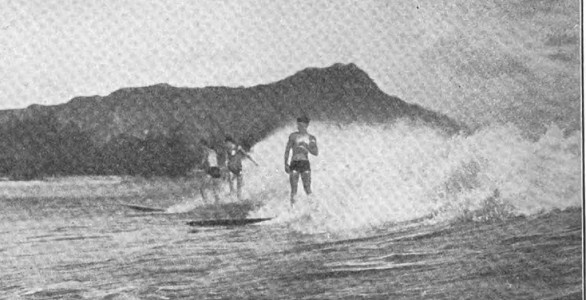 Surf-riding as Seen From the Cars of the Rapid Transport Company. 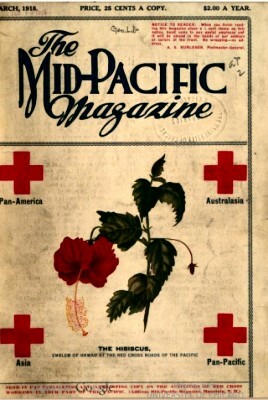 Volume 17, Number 3, March,1919. Geoff Cater (2016) : Snowy Baker : Surfing, Mid-Pacific Magazine, 1918.